Cherry are world-renowned as the de-facto manufacturers of high quality keyboard mechanical switches, especially in the gaming sphere. Their colour-coding is now effectively the industry standard when it comes to defining switch weights and actuation types. Nowadways, if you don't use Cherry, you have to be very secure in your reasoning (be you a gamer or keyboard manufacturer). A relatively recent innovation of Cherry's has been the MX Silent, a low-noise variant of the wildly popular MX key switch. The design debuted in 2015 on the Corsair STRAFE and STRAFE RGB keyboards (both of which achieved our Gold Award standard after review) and for the past twelve months has been exclusive to Corsair. 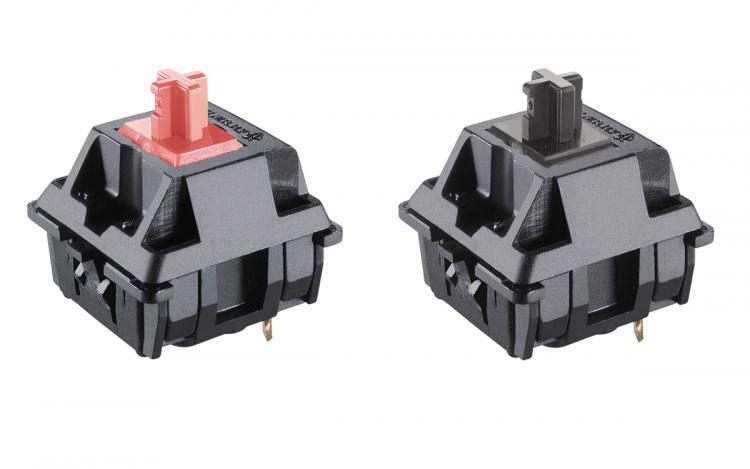 That exclusivity has now ended, and so other manufacturers are able to create designs which integrate Cherry MX Silent switches. Cherry's low-noise design is unique in that it implements noise dampening within the switch module itself, rather than use other means such as rubber O-rings to cushion impacts. As a result it can be retro-fitted into existing keyboard chassis with a minimum of fuss, or designed around to further leverage the switches capabilities and keypress dynamics. The design is currently patent-pending, and is limited to MX Red and Black speeds (as well as their clear-casing RGB variants). Expect plenty of new keyboard models to be shown off at CES 2017 and Cebit a little later in the year, no-doubt at least some of which will be featuring the Cherry MX Silent.